Relax in style and sophistication, and enjoy the outdoors with the Beacon Park Stationary Lounge Chair. 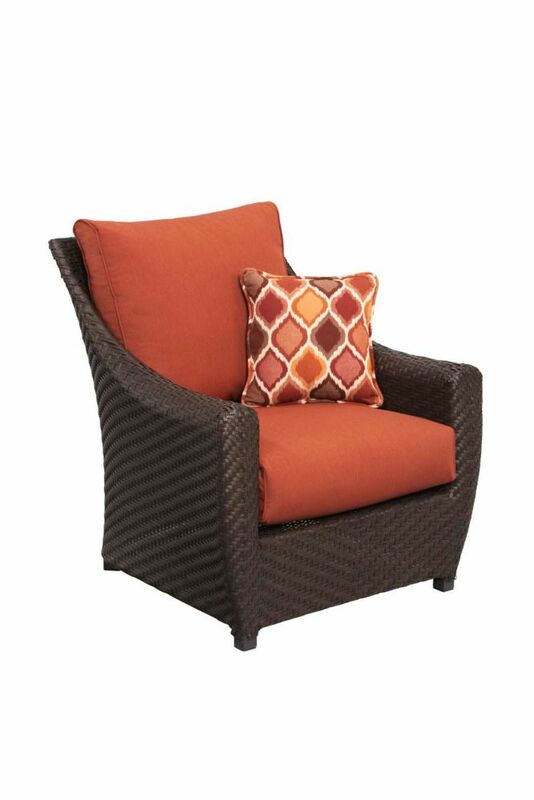 A sturdy, rust-resistant frame supports intricately woven, rich brown wicker, and features a plush olefin seat cushion and a reversible back cushion with a trellis pattern on one side, and a toffee colour matching the seat cushion on the other side. Wide, curved armrests ensure maximum comfort you won't want to give up. Use as a standalone piece, or include other Beacon Park furniture elements to create a complete look. Highland Patio Lounge Chair The Highland Collection Lounge Chair features a gracefully curved back and flared arms that create a unique surface for the herringbone weave pattern. The piece consists of fully woven panels made from weather-resistant resin that covers a fully welded, powder-coated aluminum frame, making this chair perfect for indoor and outdoor use. And the warm colour palette creates a fresh and modern aesthetic.